Magic: The Gathering’s Commander format (also known as EDH) has blown up massively in the last few years. 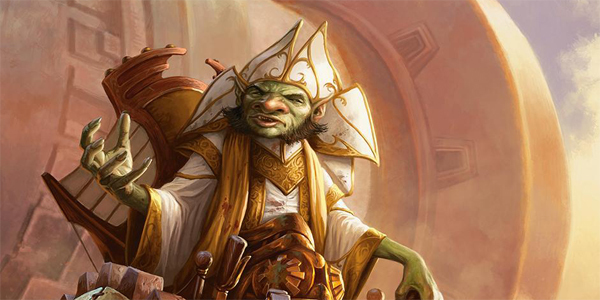 Taking the core rules of Magic, and slightly tweaking the rules really opens up the game to a whole world of deck types, crazy combos and otherwise useless cards seeing a tonne of play. However, Commander can be very daunting to get into, especially since they require a 100 card deck, so Wizards have constructed some of their own to get new players in on the action. A quick general summary of the Commander 2014 decks: They are pre-built 100 card decks for use in the Commander format. They come included with 3 potential commanders, one of which is picked at the start of the game and placed in the Commander Zone, while the other two are shuffled in with the other 97 cards. The Commander can be cast during your turn from the Commander Zone, and when it is destroyed, returns to the Commander Zone to be played again (every time it is cast this way, it costs an additional 2 mana). NOTE: When it comes to Magic: The Gathering, I primarily play Standard and Limited formats, so I am not as fully versed at the intricacies and nuances of Commander as some other players. If you disagree with anything I say in this review, please let me know in the comments below. This year, Wizards wanted to really change up the commander formula by introducing five brand new Planeswalker cards (many of whom were taken from characters in Magic’s past) and giving them the ability of “This card can be used as your commander.” It made some people furious, others joyous (I sit squarely in the latter column) but one thing’s for certain – they are a heck of a lot of fun. So… Holy crap. That was literally what I said to myself when this guy was announced. He is an absolute BEAST. 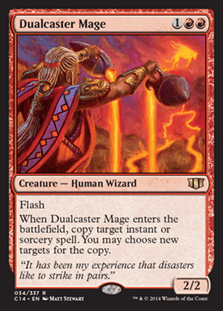 At 4 mana he is the cheapest of the five Planeswalker-Commanders, and his first ability gives Red the ability to draw cards! For those of you newer to the game, Red’s card draw ability is… well it isn’t very strong. Not only can you cycle unwanted cards in your hand for 0, 1 or 2 new ones from the top of your deck, but you can toss artifacts into your graveyard so that you can cheat them out later for close to nothing. Speaking of cheating artifacts into play, Daretti himself can do it! No longer need that Fire Diamond on the field? Sacrifice it and bring our the Wurmcoil Engine you discarded last turn! The possibilities are endless and we haven’t even gotten to his ultimate yet! Feldon lets you bring back an artifact clone of any creature in your graveyard until the end of turn. However, unlike similar spells and abilities, the creature in your grave isn’t exiles so you can repeat the process every turn! 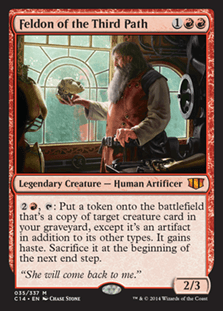 Basically any card that has an “enters the battlefield,” or “leaves the battlefield” ability can become absolutely broken when used with Feldon, and best of all if you really want to use him as your commander you CAN. 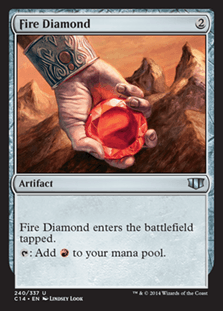 Since this is an artifact deck, it is incredibly synergistic. While the blue deck revolves around making giant blue fish, and the green deck is about swarming the field, Built From Scratch will have you carefully planning your moves (or more accurately, your STRINGS of moves) for the best result. It is one of the more thought-intensive decks to play and every time I shuffle it up and draw my opening hand of seven, I am wondering how three turns from now is going to look. Since it is very skill-intensive, it can be quite easy to get lost in the motions, so you have to make sure you are on top of your game. At the same time, if you are looking to get into Combo-based Magic, then this is a pretty damn good starting point. 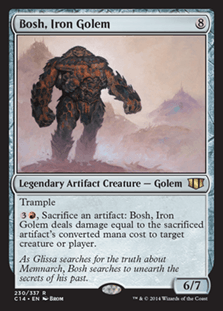 Value-wise, Built From Scratch has some of the more pricey cards of all of this year’s Commander Decks. 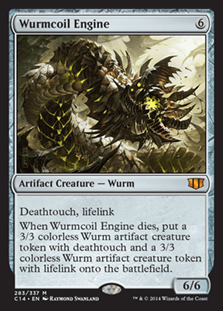 Wurmcoil Engine, Daretti and Dualcaster Mage are all worth a pretty penny, so you definitely get your money’s worth here. 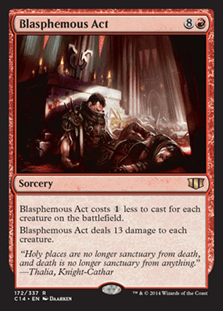 Other cards like Blasphemous Act aren’t worth as much cash, but are stupidly fun to play (wiping an entire 5-player board for 1 mana is ridiculous). Commander 2014 is a fantastic hit. 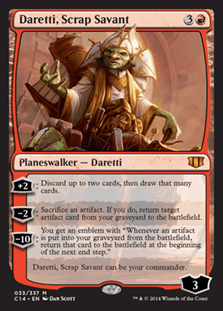 The Planeswalker commanders, while not in line with the original rules and spirit of the game are a fantastic addition, and Daretti is definitely the powerhouse among them. If you can only get one of each of the five decks then I do suggest this one, but be warned the combo shenanigans can leave your opponents a little less than thrilled with you.